Yesterday was a great day in New York City. Tens of thousands joined the #OccupyWallStreet movement in downtown Manhattan, demanding an economic system that ensures justice for working people, students, the unemployed – the 99%. It’s been a little over a week since I began going down to Liberty Square to support and participate and exactly a week since our desi bloc block of the movement’s Declaration over our concerns about it obfuscating the history and present realities of systemic racism and other forms of oppression. I have to say that yesterday, as I marched while banging the hell out of my dhol alongside so many passionate and angry and hopeful and beautiful people from so many different walks of life, the color and vibe of this movement may very well be shifting in a promising direction. With a huge presence of labor unions and community organizations taking to the streets yesterday, the culture on the ground felt and looked really different: it looked like New York City. I saw posters in Punjabi, Farsi, Mandarin, and Spanish (and probably missed many other languages as I was pretty focused on my dhol), an indigenous people’s contingent, tons of POCs from grassroots organizations like FIERCE!, NYCPP, CAAAV, Make the Road New York and the Arab American Association of NY. I spent the duration of the march rocking out with two other drummers of color, one with a Brazilian samba whistle, and towards the end, a group of others playing Afro-Cuban rhythms on congas and cowbells – a far stretch from the notorious hippie drum circles that a lot of us like to scoff at. The crowd’s energy and the rhythmic solidarity I felt with my co-drummers kept me going long after my shoulders was aching and my wrists were stiff. As we rolled up to Liberty Square in a deep bhangra groove with friends and strangers joyfully dancing in resistance to corporate greed all around us, I felt the lights of news cameras and was proud that in that very moment we were the face of the movement. Of course I understand and appreciate yesterday’s reasons for having a permitted demo and march, making it much more accessible to children, families, immigrants and thousands of other people who for many reasons are not up for risking arrest. I think we nevertheless managed to create an atmosphere of liberation and freedom within the confines of the (? )NYPD barricades, but I wonder what it would look like to build something unsanctioned, without the permission of the authorities we despise, where people of all generations and backgrounds can participate with a basic level of safety. At the same time, as arrests and police violence began on Wall Street after the march, I was frustrated by some of the “more activist than thou” protesters urging “everyone” to leave Liberty Square and go confront the police and protect our comrades. After the march, the energy in Liberty Square was all over the place, with more people in the space than ever before. A few of us had planned to do a mini concert in the Square after the march. It was a little awkward at first, but we began developing a pretty uplifting musical vibe, with Gabriella Callender of Mahina Movement playing guitar, Stephan Said and Morley singing simple wordless melodies with the crowd, me laying down some trumpet lines, and an impromptu cipher taking shape with some of the crew from the Rebel Diaz Arts Collective in the South Bronx. In short, it was a beautiful space that was developing. Without any “excuse me” or warning, three times we (and everyone around us) were interrupted by white men yelling at us, “Mic Check! !”, and then informing us of the arrests down the street and how we all must go down there to intervene. I appreciated the information and urgency, but not the patronizing tone taken by most of those who made these announcements, implying that if we’re really committed to this movement, then we should go confront the police. I’ve seen this many times before in activist circles where white men willing to confront the police and/or risk arrest think that everyone else should be willing to do the same. No doubt, countless people of color, immigrants, queer and trans folks, women, and people with disabilities have historically (and currently) put their bodies on the line for justice, but that should always be our choice and on our own terms. Getting arrested has very different implications for different communities and for different individuals. If these men wanted to go confront the police while they are pepper spraying protesters, then great, but I wish they recognized that their ability to make that decision so quickly and easily is related to their privilege. I was disappointed by the arrogance, lack of nuance, and entitlement in the way these white men made their pleas to us (who incidentally were mostly people of color). Multiple white men, multiple times. So, while I hope the #OWS movement continues to build toward more civil disobedience, we need to build a lot more consciousness in the space about oppression, power and privilege. We need to build a movement that is inclusive of everyone who came through yesterday, all 20 to 40 thousand of us. I remain hopeful. Was that your bhangra crew on Democracy Now? Crucial points here, Sonny. Stress, exhaustion, and a sense of danger can sure bring out a person’s inner boss. Hope they can learn that the stakes are never the same for everybody in direct confrontation. i hear this critique of white activists a lot, and think there are a lot of problems with it. i don’t want to go into too much detail on why, but only say that in my experience i’ve seen these arguments used by people of color to 1) justify conservative positions against direct action and radical politics, and 2) only guilt white organizers so POC can feel holier than though. 1) how should those white activists have approached POCs, and what should they have said that is different from how they did it? 2) if POC and other oppressed peoples have faced the cops before, why can’t they do it now (or at that moment)? and i don’t mean this as a moral question — as Sonny has conceded history has demonstrated that POC and other oppressed peoples are very capable of fighting the cops, which i agree with 1000% — but a real, practical question of organization and strategy. 1) If Radio Head had been playing, these white guys probably would have at least waited until a song break to make the announcements. 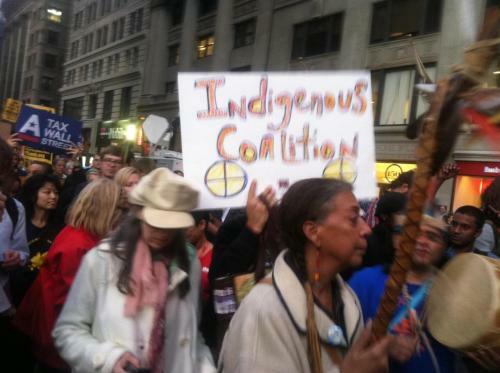 As activists, the talented groups led by people of color deserve equal respect in the space of OWS/Liberty Plaza. 2) The way reply poses the questions implies that agreeing to be arrested is necessary to the organization and strategy of the movement. To be an activist one is not required to sign a pact to be “on called to be arrested”. Deciding not to be arrested does not make you any less of an activist and it does not necessarily weaken the movement. At times mass arrest is a powerful tactic, but even in those situations it is fundamentally unethical to pressure individuals who will have more negative repercussions as the result of an arrest to be “on call” – it is a choice. I really appreciate Sonny’s comments on some of the inclusiveness of Wednesday’s march. In spite of the cages we all hate, we all made it a more inviting environment for a larger spectrum of people to join in and unite in support of one another. I hope that the occupation site will build upon that energy and make a concerted effort to make OWS/Liberty Plaza a more inviting and inclusive space to all races and genders. Thanks for your comments dharr and ruralgal. I would echo ruralgal’s sentiment about people making their own choices about risking arrest, civil disobedience, and police confrontation, and that pressuring anyone to do these things is problematic. My experience of being yelled at by these few white men on Wednesday night was unpleasant and frustrating. I understood their urgency, but what they did not do (which is far too common for folks with unchecked privilege of various sorts) was take a moment to be thoughtful and self-reflective in the way they were asserting themselves and taking up space. It could have gone very differently. They could have been polite. They could have whispered in one of our ears if we could stop the song for a minute because the situation was urgent. They could have made their announcements in a way that invited and encouraged folks to go march to where people were getting beat up and pepper sprayed without putting pressure on people and assuming this was what everyone needed to do. thanks so much for this truth and documentation. why do you use the word hell? we should not go around abusing others belief system. I wouldn’t like it if I heard ignorant white people saying i bang the Narak out of something. On the one hand you say being penned up in cages “doesn’t feel right” and that we shouldn’t play by the NYPD’s rules. On the other, you did not appreciate that people failed to say “excuse me” when the cops snatched and arrested a bunch of people and organizers tried to mobilize people to get over there quick to prevent any more brutality/harm/snatching. Also, are you aware that a bunch of them rushed the fence at Wall Street and got peppersprayed? There were 27 arrests. It is not factually accurate to portray this protest as some sort of mild, tame, perfectly legal demonstration when dozens, maybe hundreds, bum rushed the NYPD at least twice at the Wall Street-Broadway intersection after a mass meeting decided to do this. i’m not quite sure what you’re getting at here. i know about the arrests, i know about the police brutality. i’m doubtful that “bum-rushing” the NYPD was what was decided at the meeting, but perhaps others who were at that meeting can comment on that. and to your first point– of course i believe civil disobedience is important and necessary. AND people need to learn to check their privilege and the way they’re taking up space in even urgent scenarios like this one. AND we can’t have this “more radical than thou” tone so pervasive in our movements if we intend to be successful, work together effectively, and make space for new people from all backgrounds in our struggles. i think stephanie hits the nail on the head below. These examples display the same phenomena to me. What I hear Sonny saying is: direct action could be good, militancy can be good, but let us make the decisions collectively in a collective space. When the white activists asserted there was only one “right way” they are closing discussion, sometimes literally. This no longer feels like a collaborative effort. If we take direct action, people should be informed of the actions and understand the risks. We should have consensus about the tactic. I agree that the people’s mic can be annoying – it can be hard to hear and it slows things down a lot. But on the other hand, it really makes you see how dependent we are on one another. We must build community with those around us just to hear. We are forced to make eye contact with people in the crowd – something that rarely happens in political talks. We are responsible to one another so that everyone can hear. I’ve wondered if those white guys shouting out about getting a sound system are either too impatient to build community, too used to have things come to them easily, or perhaps a bit scared of the vulnerability that comes with joining into the group. So, to answer the commenter above on question 1, my answer might be that what they should do differently is to approach this as a real dialogue, where they are not just giving their opinions but also listening to what they hear in response. Listening means hearing concerns, and engaging in conversation about those. I’d also suggest that they try to take into account some of these same concerns as *their own. * The fact that people of color are much more vulnerable in the legal system should be as much of a concern to the white activists. This is a moral issue, but it is also strategic: We are in this together, and if not together, we will fail. Thank you Sonny, this is beautiful. I love how you describe the diverse communities you saw at the march that are reflective of NYC. That’s great you brought your dhol too! I agree with you to keep the hope and optimism up. I hear what you’re saying about how power and privilege play out with the white men at liberty square. For me, I have experienced similar situations and so I think it’s very important for us to use our voices when these things happen and raise consciousness in the space. In those moments, I also remind myself of my intentions, which are also some of the values I hope our society can one day be truly based upon: love, forgiveness, compassion, and patience. So when I experience white folks not checking their privilege, I remember to love them and stand with them anyway…why? Because the Earth and our humanity needs us to, and my love for all of us is too great to not heed that call. Of course, let’s keep up the constructive critical analysis too, which you are doing in such an inspiring way. thanks for the response, ruralgal. here’s my rebuttal. 2) i appreciate this second response because it’s pushing me to be clearer, and prompting a tangential yet important discussion. i didn’t mention specifically “getting arrested” although that’s certainly an important strategy to consider. i also never said being arrested is necessary or makes you any more or less of an activist, but i understand that’s what Sonny says those organizers were doing, so i’m not sure if this part of your comment was directed at me or not. in the end, however, you (and Sonny) are right. the direct action junkies and people who think guilt trips and emotional blackmail are the way to organize can be extremely reactionary. i asked about facing or standing up to the cops, which i’ll admit is also tactically vague. Sonny on the other hand used the word “intervention” which could be either a defensive or offensive maneuver by these organizers with either direct or indirect contact with the police. all this still, however, doesn’t respond to my questions about organization, strategy, and maybe consciousness. i hope others engage as well. another good point about the tactical vagueness of what these guys were calling on us to do in that moment (interruptions and rudeness aside). i don’t think they had much of an idea of what to do (which i totally understand) and were driven mostly by a sense of urgency but also what felt like a bit of alpha male aggression. i.e. let’s go confront the cops without a plan or without thinking through what that means or what that looks like. This is great. Thanks for sharing! People (white men specifically) really need to check themselves and realize how much space they’re taking up. The whole white man yelling at a group of people because some people were getting arrested was ridiculous because of the way it was done, how many times it was done and because of who the people were that kept feeling the need to interrupt. There needs to be a lot of education to the young activists that have “been down at Wall Street since day one” (self proclaimed). I think voicing critical opinions (like this blog site) and letting people know that it’s out there is a great way to start! thanks for this adam. i didn’t know that went down at GA. we have a lot of work to do, for sure. glad you’re in the struggle with us. i think there will be a post on here soon from a woman of color who was shut down/silenced at GA in the near future. please encourage people to send submissions to us to share their stories and thoughts! i would need to hear what what her argument was before i can offer much of an analysis, but why shouldn’t civil disobedience be employed? again, not a moral question, i.e., “We must do it,” but a real question of strategy and tactics. i’d like to hear both why and why not, but also what we would need to do it. did the women speaking about the threats to undocumented peoples and others propose strategies for how to mitigate these dangers? did anyone else? if the argument was “We’ll get arrested – we shouldn’t do it,” then it was a conservative argument. one of the most basic lessons to take from Dr King is that unjust laws must be broken, but Dr King was also an organizer. he didn’t just rush head strong into these actions without strategizing, and that’s what i’m asking about (but not getting much of a response). thank you, thank you, thank you! keep writing, sharing, pushing, exploring. Just wanted to make some jazz hands and agree – this is what we need. Been thinking fuzzy, similar thoughts… thank you for articulating yours so well, and sharing. It’s liberating to talk to so many people who have moved past fear of exploring and sharing these topics that so often get ignored.